Certech registration offers registration of cosmetics manufacturers to ISO 22716:2007 Good Manufacturing Practices (GMP) - Guidelines on Good Manufacturing Practices which provides guidelines for the production, control, storage and shipment of cosmetic products. The guidelines cover the quality aspects of the product, but as a whole do not cover safety aspects for the personnel engaged in the plant, nor do they cover aspects of protection of the environment. Safety and environmental aspects are inherent responsibilities of the company and could be governed by local legislation and regulation. The guidelines are not applicable to research and development activities and distribution of finished products. The introduction to the guideline clarifies that it is intended to provide guidance regarding Good Manufacturing Practices for cosmetic products. The guidelines were prepared for consideration by the cosmetic industry and take into account the specific needs of this sector. The guidelines offer organizational and practical advice on the management of the human, technical and administrative factors affecting product quality. The guidelines have been written to allow them to be used following the flow of products from receipt to shipment. Additionally, in order to clarify the way this document reaches its objectives, a 'principle' is added to each major section. Good Manufacturing Practices constitute the practical development of the quality assurance concept through the description of the plant activities that are based on sound scientific judgment and risk assessments. The objective of the GMP guidelines is to define the activities that enable you to obtain a product that meets defined characteristics. 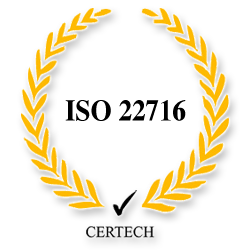 Certech Registration has developed effective protocols for identifying conformance to ISO 12716:2007. Audits are conducted by experienced system auditors and are designed to add value to cosmetics organization through detailed feedback and identification of opportunities to improve the effectiveness of their GMP processes.